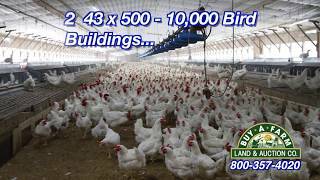 A fully operational 20,000 hen breeding egg operation just South of Carrier Mills in Saline County Illinois. Look around and you will see this is a well-maintained and well-run operation. All updates have been made to ensure all available bonuses are achieved for a profitable operation. The operation is currently under contract with a major poultry products company. Other buildings include a newer double wide home, 2 pole buildings and a lakeside cabin. Shown by appointment only.